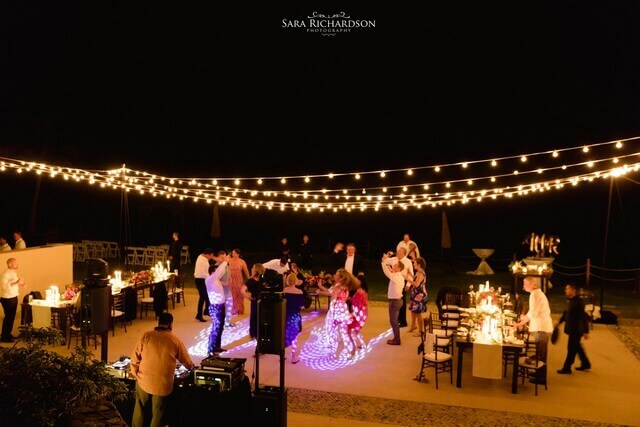 If you’re wondering what a Cabo beach wedding might look like, you’ve come to the right place. 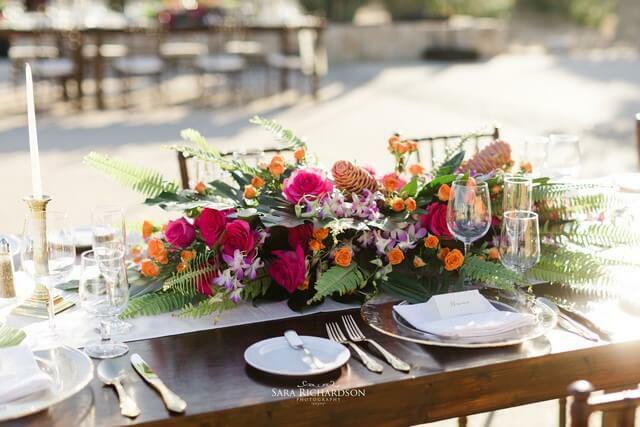 Creative Destination Events specializes in event and wedding planning in Cabo San Lucas and works to make any event, no matter how small or large, come to life as the client envisions. Preparation for these events include several digital meetings, photos exchanged, inspiration boards created, and tons of phone and email communication between the bride, our event planners and other involved entities. Our team also helps prepare all the individuals involved in the wedding such as guests, vendors, entertainment, the designer, photographer, makeup and hair stylists, etc. Our wedding planners manage this with a very hands-on approach. We will visit the venue as many times as needed while planning. We will act as a liaison when the bride needs direct contact with local businesses or individuals who may only speak Spanish. We taste-test, listen to local entertainment, and work closely with designers and hotel staff. 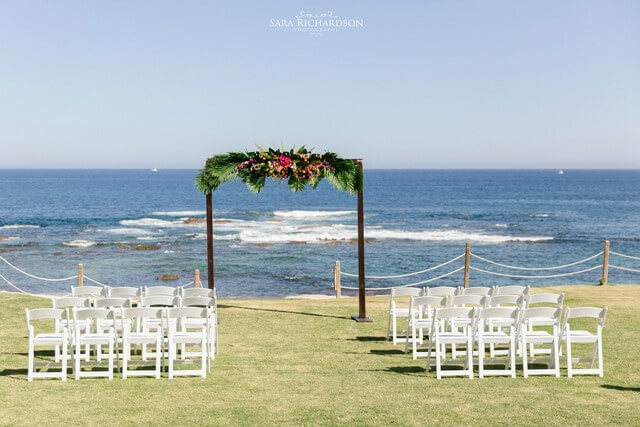 On the day before or of the Cabo beach wedding, our expert event planners begin to transform the space with designers and staff, helping to set the scene for the big event. From the start of set-up to the end of take-down, not a single detail goes unplanned or unpolished. With Creative Destination Events, there is always someone on site to relay the bride’s concerns and requests. 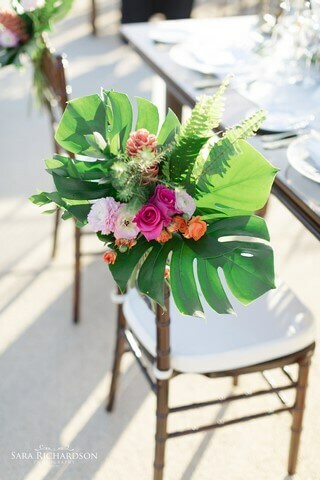 Recently, Creative Destination Events helped one special bride plan and execute her Cabo beach wedding showcase, transforming an outdoor space at the Grand Fiesta Americana Hotel in to a tropical paradise for the couple and guests to enjoy. Sara and Todd were married on May 13th, 2017 in a beautiful and intimate outdoor ceremony. The couple chose an excellent location, providing them incredible beach views from a grassy area nearby. 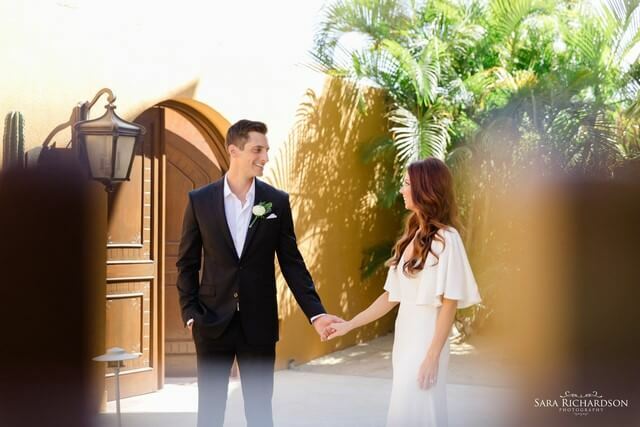 The ivory dress worn by Sara and white chairs incorporated in to the outdoor ceremony held tightly to tradition, but the tropical archway arbor and impressive tropical bouquet added the perfect amount of Cabo San Lucas spirit to the showcase. The archway and bouquet were made with intense greenery and striking magenta, orange and pink flowers. This color scheme stood-out from, but also perfectly complimented, Sara’s two bridesmaids wearing sweeping navy-blue dresses. In its entirety, the navy, the bride, the bouquets and the scenery came together in the most fabulous and picturesque way. 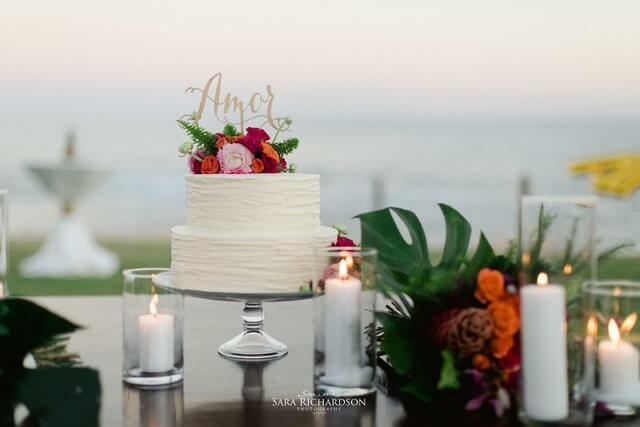 The reception, following the same theme, was as intimate as the Cabo beach wedding ceremony. The picturesque scene included long wooden tables, beautiful table and glassware, long and thin white runners and centerpieces matching the bouquets. 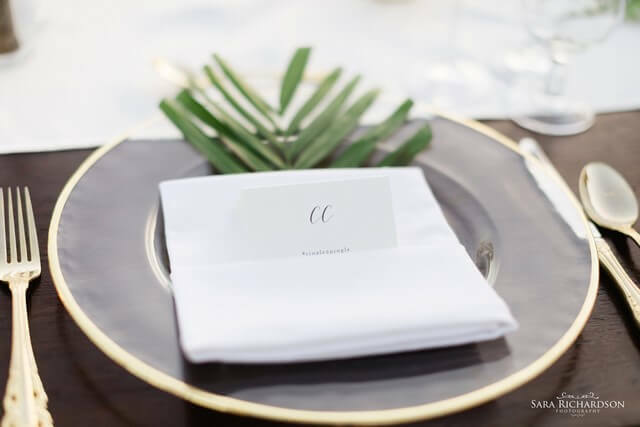 Ultimately the simple and clean decor, with an outdoorsy and tropical feel, ended up setting the perfect scene for this stunning couple’s wedding day. The day quickly turned to night, which ended beautifully with a lit-up patio for dancing, and sparklers in the air to send off the happy couple. The staff at Creative Destination Events is proud to have planned and executed this event alongside Sara and Todd. Couples and scenes like this one always inspire us and ignite our passions for event planning. 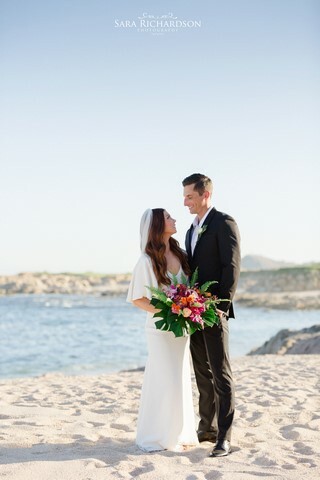 If you need help planning the perfect Cabo beach wedding, please call us at 619-819-9180 to become one of our happy brides. 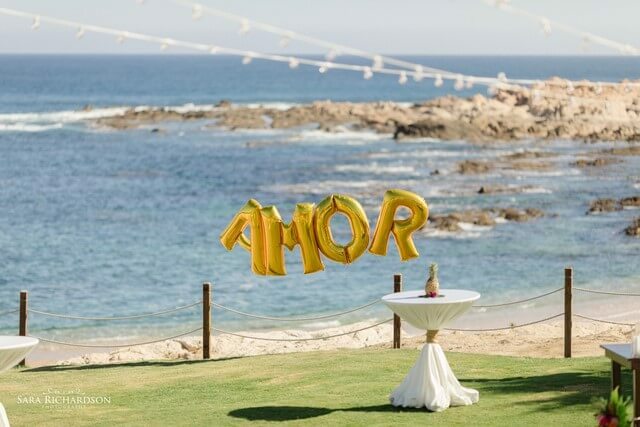 This entry was posted in BEACH WEDDING, CABO WEDDINGS, DESTINATION WEDDINGS, LOS CABOS WEDDING PLANNER and tagged Los Cabos Beach Wedding.